I whipped up a batch of these pancakes this morning for our breakfast. 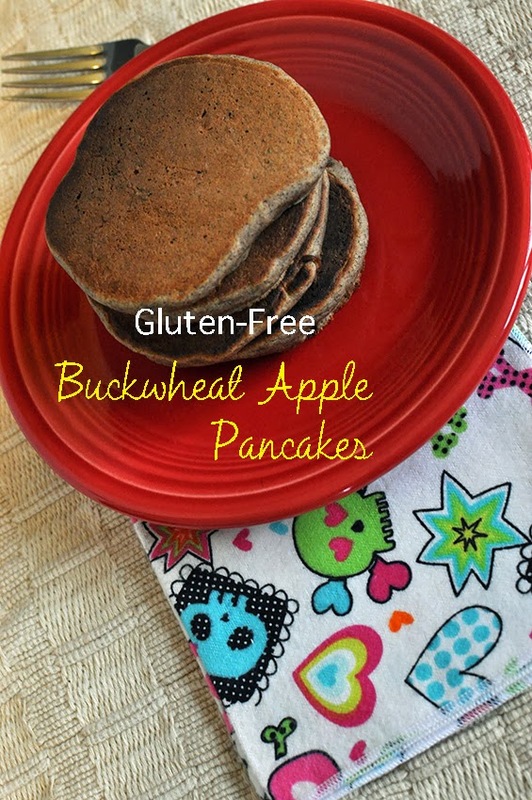 They are gluten-free, dairy-free, and have applesauce instead of added sugar. Served with my almond strawberry syrup, they were the perfect lazy weekend morning breakfast. 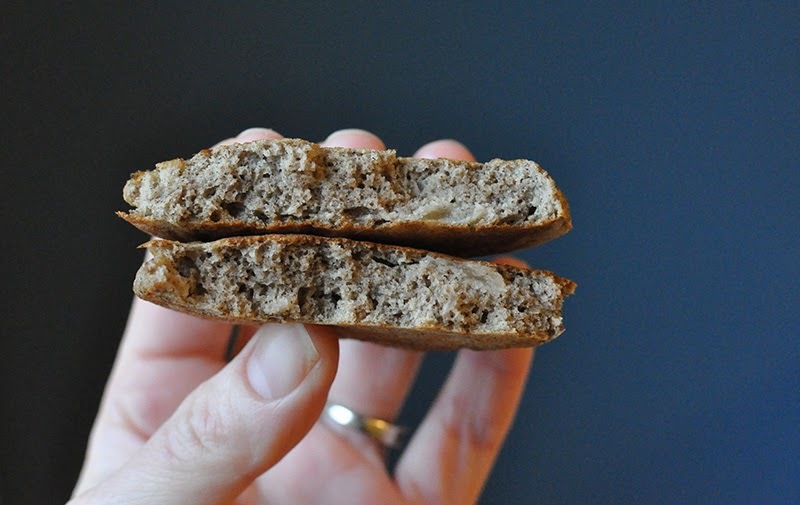 They are easy to make up quickly from scratch, especially since they only require 6 simple ingredients – buckwheat flour, baking powder, cinnamon, eggs, applesauce, and water. I have learned from countless messy first flips to allow the griddle to heat thoroughly and look carefully at the edges of my pancakes before flipping. The edges should look slightly dried and the centers should be bubbling. These are nice and fluffy pancakes. If you like your short stack on the thinner side, omit the baking powder. 1. 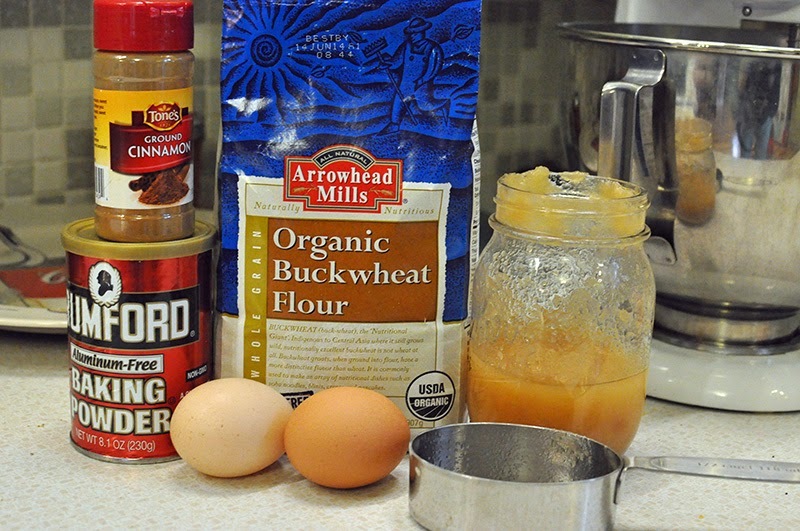 In a medium bowl combine: 1 cup buckwheat flour, 1 teaspoon baking powder, 1/2 teaspoon ground cinnamon. 2. 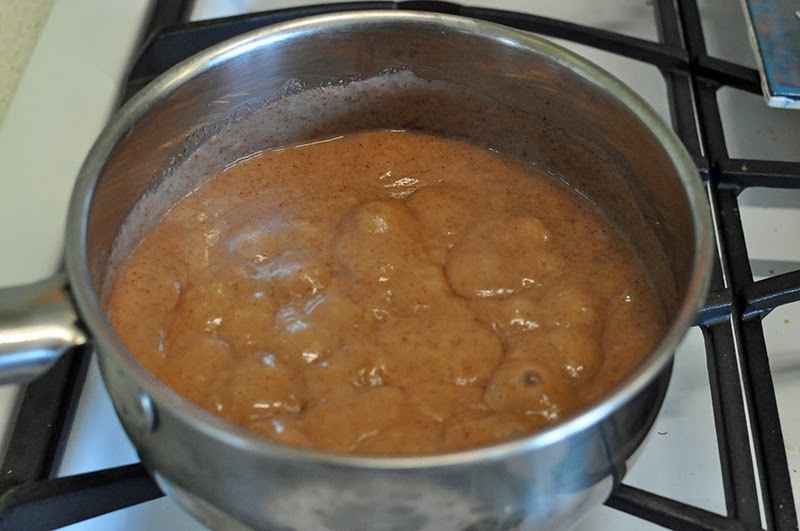 In a small bowl combine: 2 eggs, 1 cup unsweetened applesauce, and 1/2 cup water. 3. Make a well in the dry ingredients, add liquid ingredients, and combine with a few swift strokes. Batter will be lumpy. 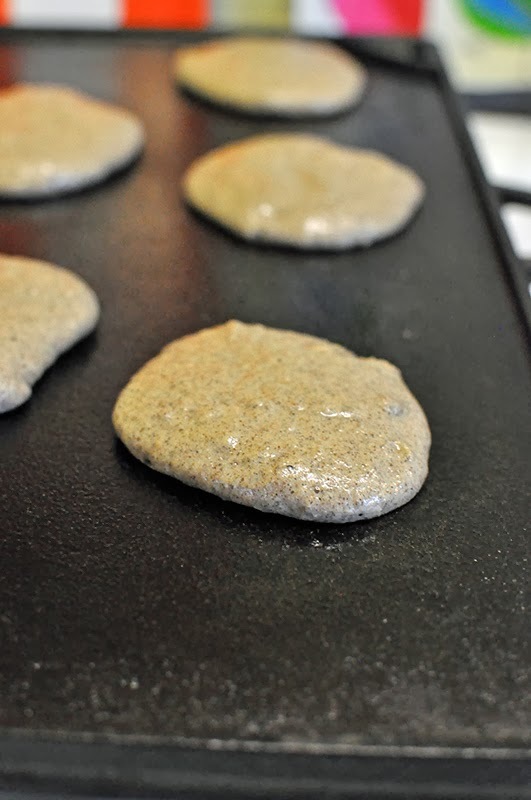 Allow batter to rest for 10 minutes while pan or griddle heats up. 4. Pour 1/4 cup of batter per cake onto hot and greased griddle or pan. Cook about 2 minutes per side, or until edges are dry and centers are bubbling. 5. Serve with topping of choice. 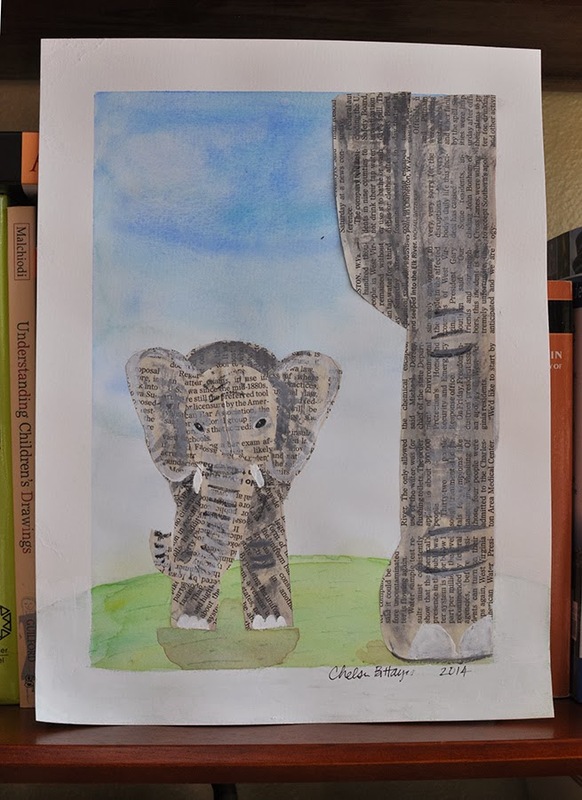 Baby Elephant, newspaper collage, acrylic paint, and watercolor on paper, 9×12″, 2014. This is the most recent nursery artwork that I completed only this week. It is for a colleague who is expecting a boy in March. I have been returning to my painting and collage roots as of lately. Hopefully I can get some more work done this weekend to share with you. It has been so snowy, blustery, and plain old cold around here lately. I have been dreaming of warmer climates and watching the weather of all my favorite warmer places – Savannah, Key West, Ocracoke, and Greensboro. Sigh. It is a little torturous at times. To beat the winter blues, I made this salad over the weekend – it has three of my favorite fruits in it with just a smidge of lime juice and cinnamon. It is a perfect healthy side salad, breakfast, or snack. First, peel 1 mango. Slice off wedges. Put into a bowl. Next, slice the ends off of 1 blood orange. Cut off peel and pith and then slice to create supreme wedges. Hopefully yours looks neater than mine did. Place in bowl with mango. Slice 1 avocado and remove pit. 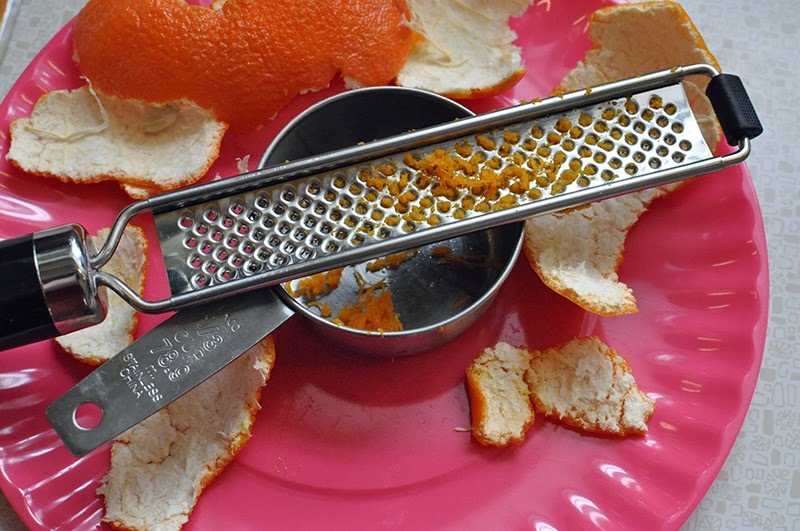 Use knife to cut vertical and horizontal slices in the halves (see above). 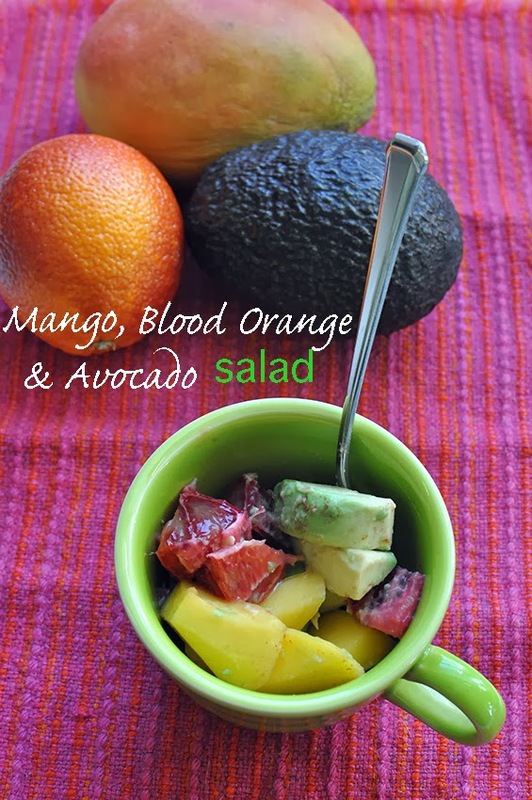 Use a spoon to remove slices and add to bowl with mango and blood oranges. Toss with 1 teaspoon lime juice and sprinkle with cinnamon. Enjoy! 1. Peel 1 mango. Slice wedges. Put into a bowl. 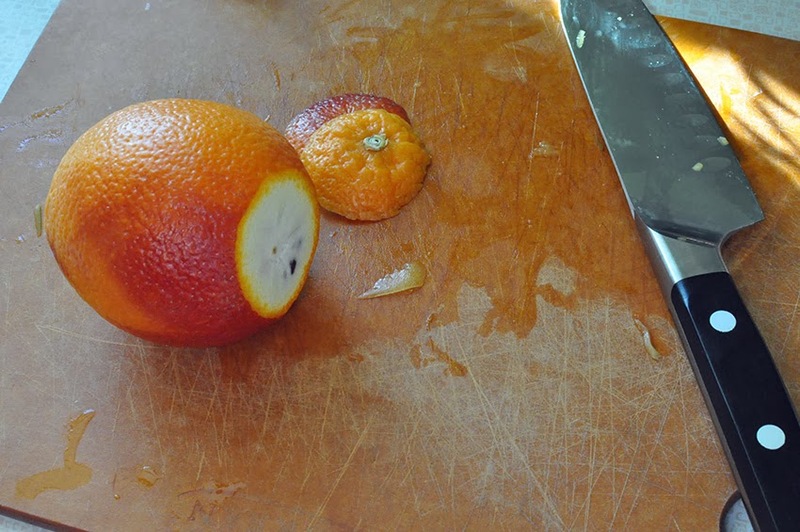 Next, slice the ends off of 1 blood orange. 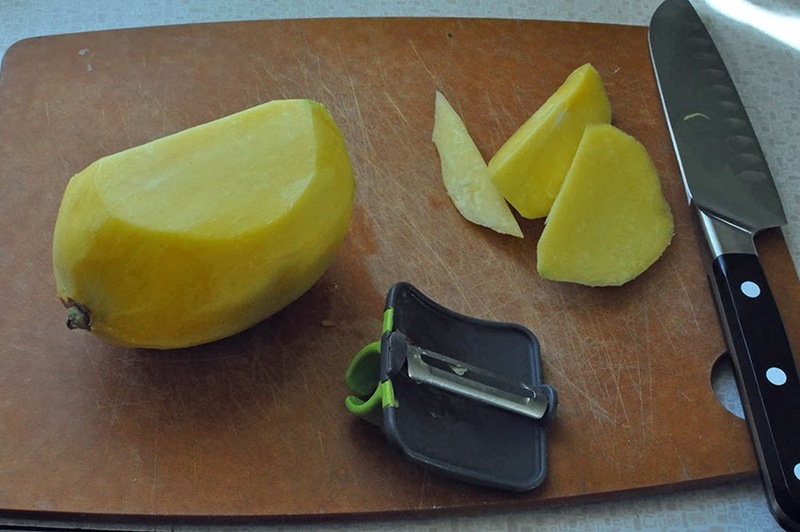 Cut off peel and pith and then slice to create supreme wedges. Place in bowl with mango. 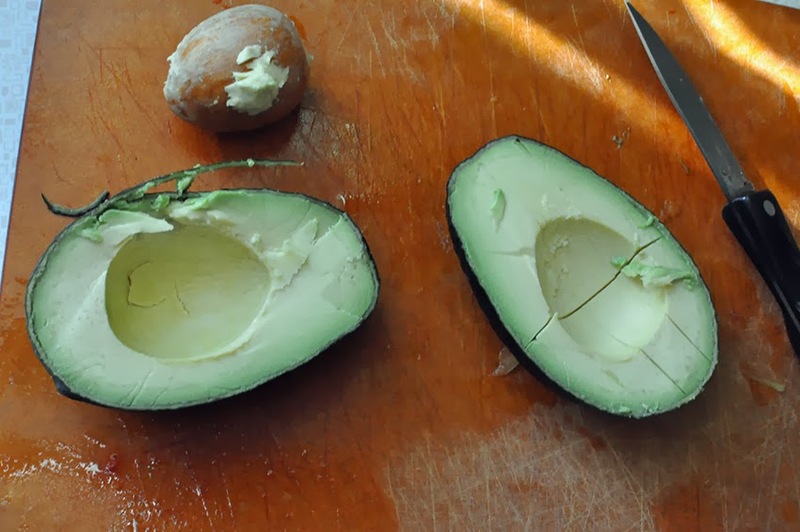 Slice 1 avocado and remove pit. Use knife to cut vertical and horizontal slices in the halves. 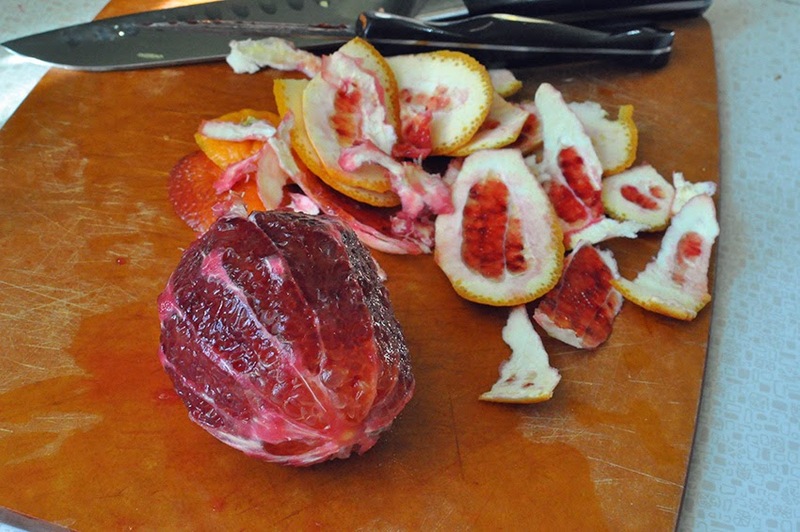 Use a spoon to remove slices and add to bowl with mango and blood oranges. 2. Toss with 1 teaspoon lime juice and sprinkle with cinnamon. Serve immediately. This recipe builds off of my basic buttermilk waffle recipe from an earlier post. I made this batch whole wheat, added berries, and topped them with a home made syrup from strawberries and almond butter. These waffles are so light and fluffy, you won’t be able to eat just one! I learned how fast these go the last time I made waffles, and this time around I made a double batch. It’s cheaper and tastier to freeze extra waffles than to buy them frozen at the store. The secret in this waffle recipe is the addition of whipped egg whites. 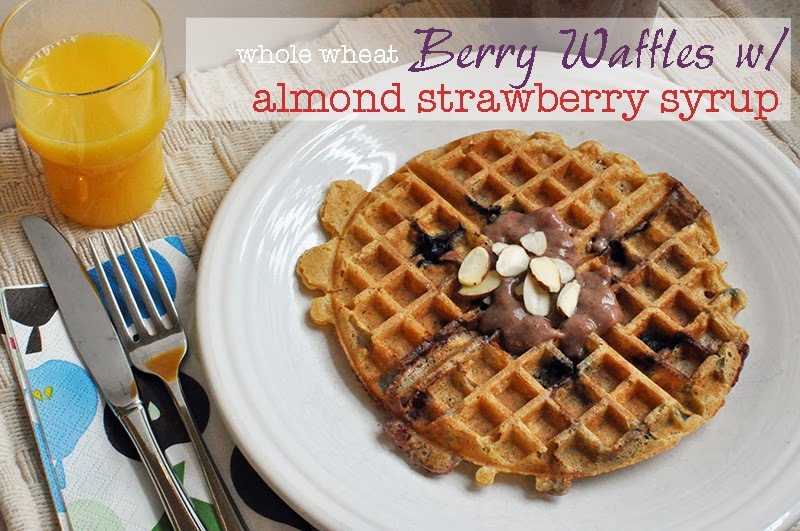 When I add berries to my waffles, I always drop them in by hand, rather than mixing them into the batter. Then I can control how many are in each waffle and how close together they are. This sounds controlling, I know, but it prevents little doughy pockets from forming around clumps of waffles. 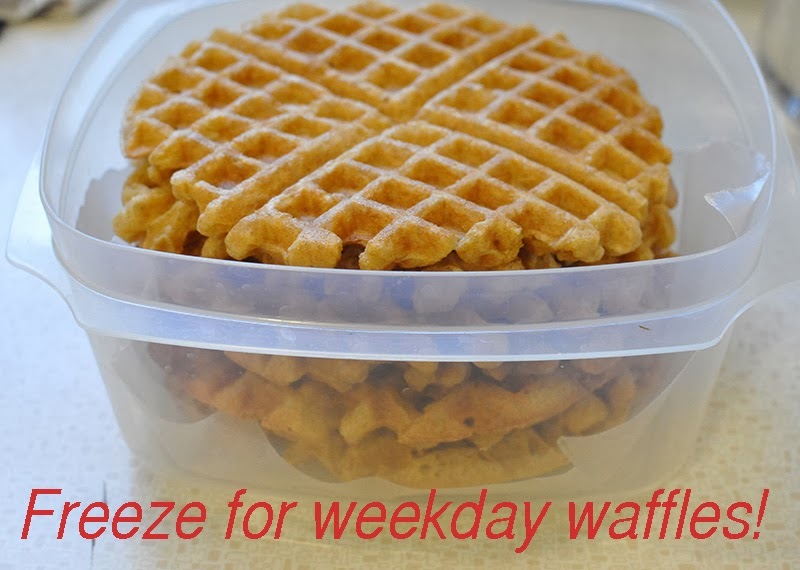 I let my extra waffles cool on a wire rack and then packed them into a large container to freeze for weekday home made waffles. This syrup is my new favorite – it’s the best of both worlds. It is like having a peanut butter and jelly sandwich but in a syrup form. It’s not super sugary, so if you like your syrups sweeter, add some more maple syrup, honey, or sugar to the recipe. 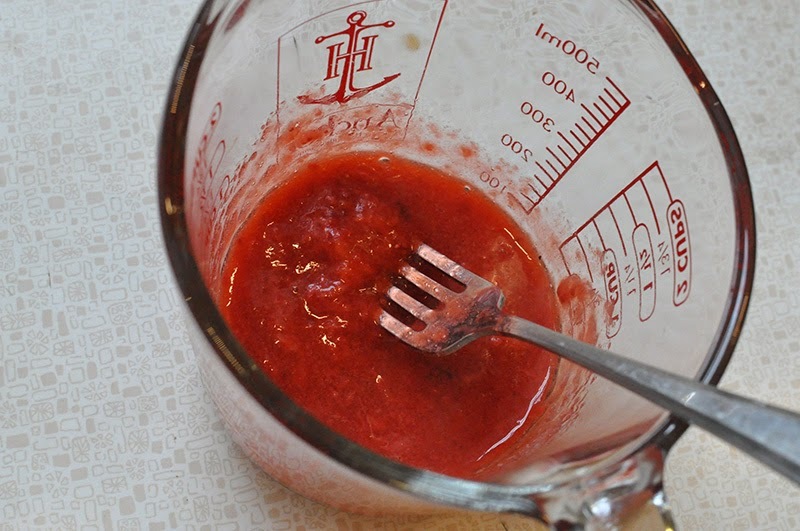 The strawberry flavoring comes from defrosted and whisked strawberries and strawberry jam. Put it all in a saucepan and heat until thick and bubbly. Store the leftovers in a glass jar and reheat when ready to use. 1. Sift: 2 cups whole wheat pastry flour, 1/4 teaspoon baking soda, 1-1/2 teaspoons baking powder, 1 tablespoon sugar, 1/2 teaspoon salt. 3. Combine the liquid and dry ingredients with a few swift strokes. Allow to sit while preparing egg whites. Beat until stiff peaks form, but not dry: 2 egg whites. Fold egg whites into batter. 4. Cook according to waffle iron and preferences. 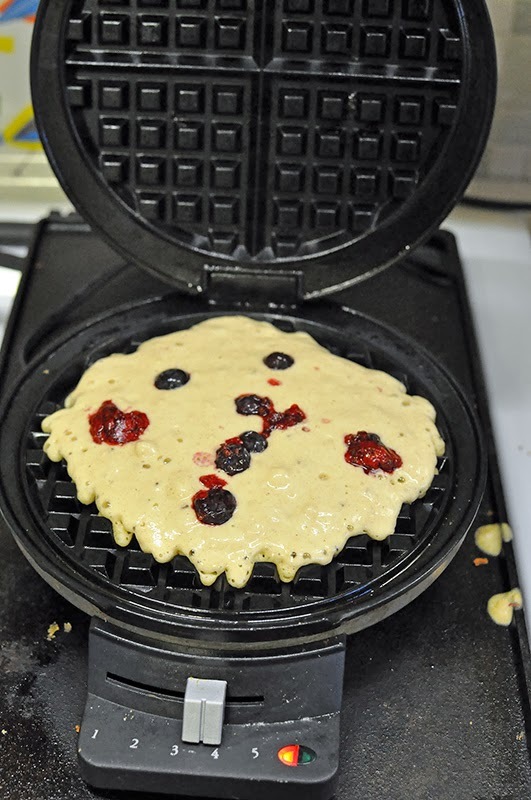 Drop fresh or defrosted berries onto batter before closing waffle iron – this way you can control the amount and the spacing of the berries. Serve with almond strawberry syrup (see below). 1. 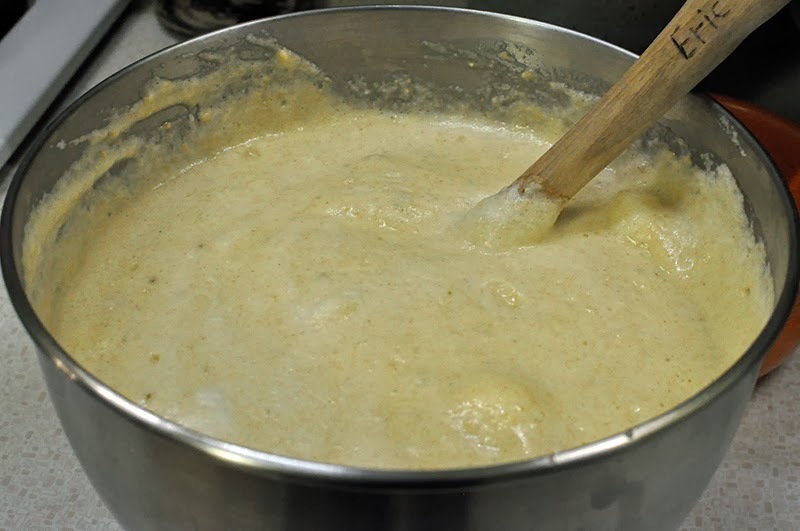 In a small saucepan melt 2 tablespoons butter or margarine. Defrost 4 – 5 large frozen strawberries. Whisk until liquefied and add enough water to equal 1/2 cup liquid. Add to melted butter/margarine and whisk to combine. 2. 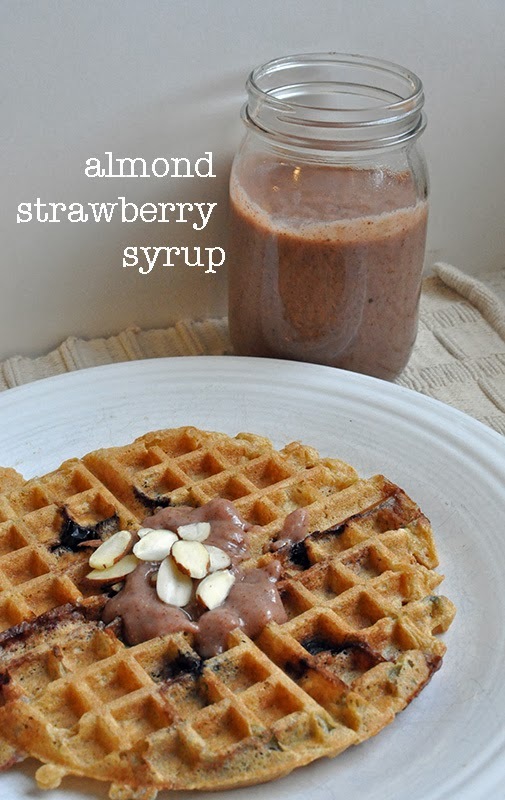 Add 2 tablespoons maple syrup, 1/3 cup creamy almond butter, 2 tablespoons strawberry jam, and 1/2 cup water. Whisk to combine. Bring mixture to a boil. Then reduce heat to low for 5 minutes, until bubbly and thickened. 3. Serve warm or cool. Store in jar in the fridge. I’ve been working my tail off trying to wrap up some art projects around here. I made a promise to myself to allow more time to make art in 2014 – we shall see how that promise holds up. Some of the projects are for myself, while many are for others. I do believe that half the women I know are having babies in 2014! This painting is for a coworker who is having a girl any day now. She is going with silver, gray, and pink in the nursery. 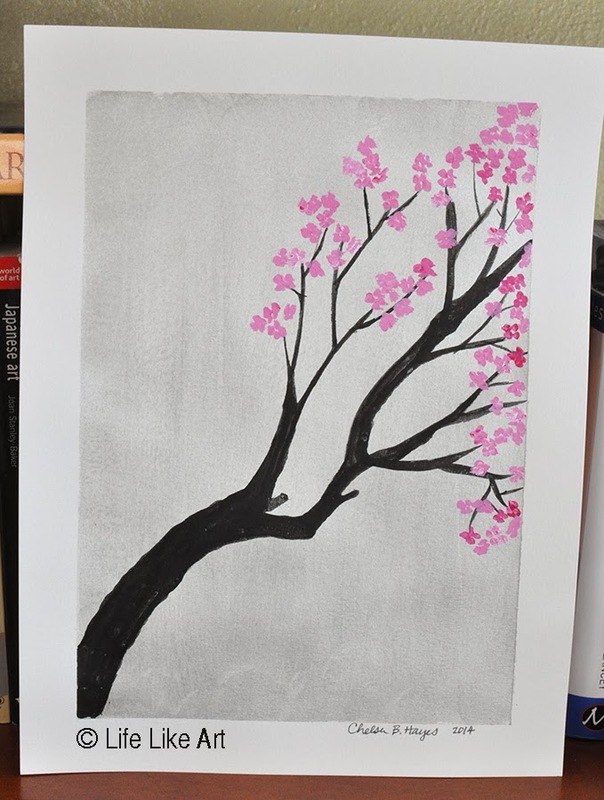 I stuck with a simple silver background, a stark black branch from ink, and bright pink cherry blossoms. 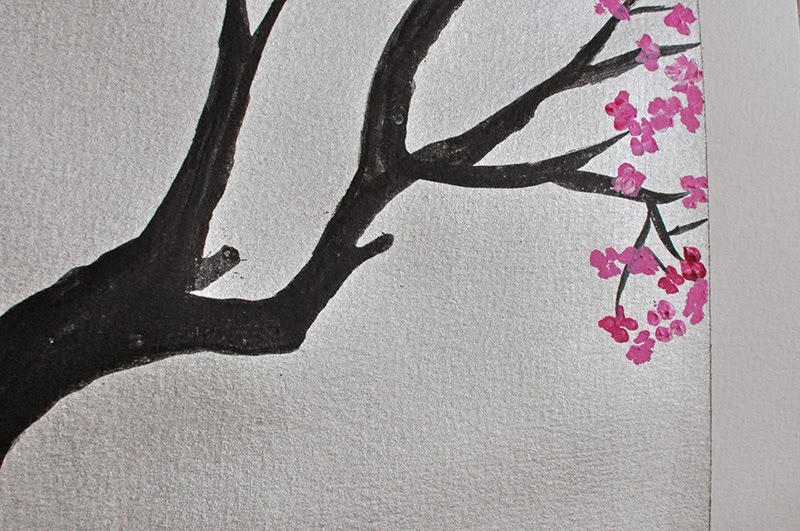 Cherry Blossoms, acrylic paint and India ink on paper, 9×12″, 2014. This close-up shows the silver off a little better. I used India ink so that I could drop the ink on the paper and then blow the ink to create interesting organic lines for the branches, then I went back in and filled in with a brush. Prints and artwork are always for sale, please inquire by e-mail or through my Etsy shop, which is currently empty. If you are interested in purchasing something you have seen on this blog, I will create a custom listing for you. I also do custom commission pieces as well. 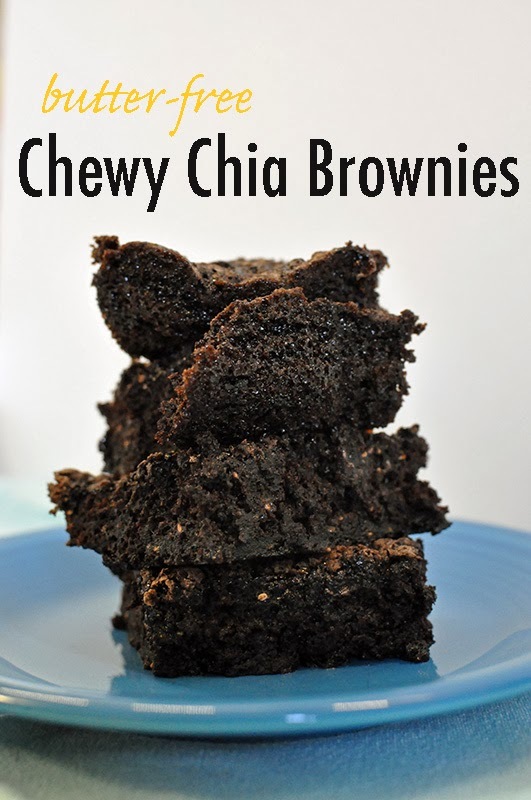 I made these delectable treats yesterday afternoon – I had been reading about using chia seeds as a replacement in baking for butter due to their ability to gel. I had never baked with chia seeds before and was, admittedly, a little nervous. However, the results were pleasantly chewy and most of a 9×13″ pan of brownies are gone. 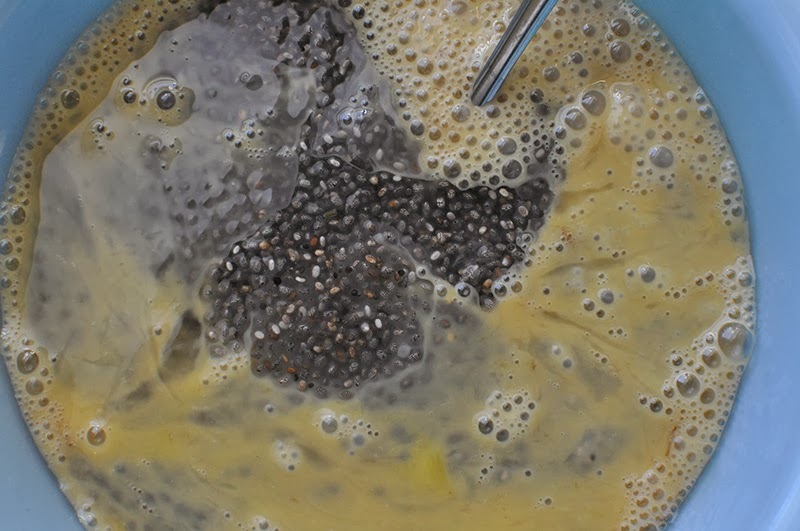 In order to use chia seeds as a butter or gluten replacement, they must be mixed with water. It is only then that these little super seeds begin their gelling magic. Not bad, not bad, little seed. I simply soaked my chia seeds in water for an hour before using, and then combined them with the liquid ingredients. My next steps are to try grinding the seeds before soaking to make a more even texture. There is a little crunch to these brownies, which did not bother me one bit, I likened it to small nut pieces. I opted for whole wheat pastry flour. I have been using this as a swap for white all-purpose flour quite a bit lately and have been liking the results. Next time I make these brownies they will be gluten-free. I am sure the chia seeds will work wonders in gluten-free flour. Note: I made a large batch, but the recipe below can easily be reduced by half to make a smaller batch, just simply use an 8×8″ or 9×9″ pan instead. 1. 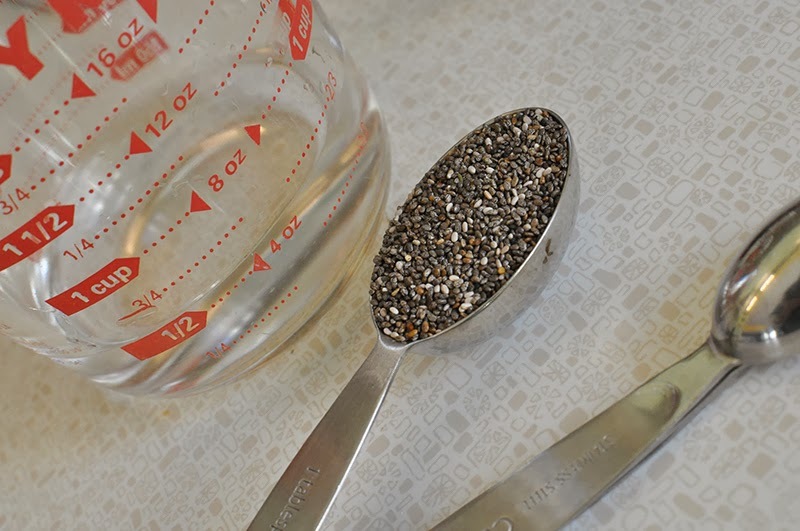 In a small bowl combine: 1 cup water and 2 tablespoons chia seeds. Allow to soak for 1-2 hours before using. 2. Preheat oven to 350 degrees. Grease a 9×12″ glass pan with margarine. Set aside. In a large mixing bowl combine: 1-1/3 cup whole wheat pastry flour, 1/2 teaspoon baking soda, 2 cups sugar, and 4 tablespoons dark unsweetened cocoa powder. 3. In a medium mixing bowl combine: 4 eggs, 2 teaspoons vanilla, and the chia seed and water mixture. 4. Make a well in the dry ingredients. Pour in liquid ingredients, combine just till moistened. Pour batter into prepared pan. Bake in 350 degree oven for 35 to 40 minutes or till knife inserted in center comes out clean. Now, I know this might seem like a duh project, but it gave us cheap thrills and great giggles! 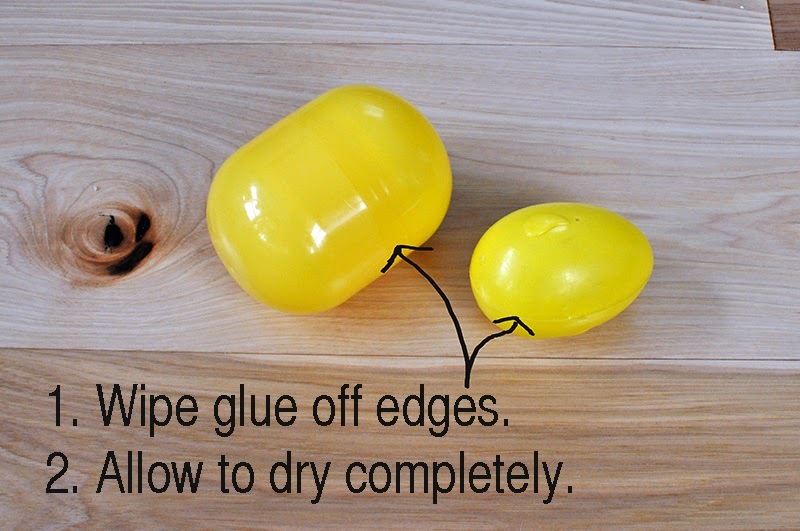 Greta and I made these DIY egg shakers before Christmas. 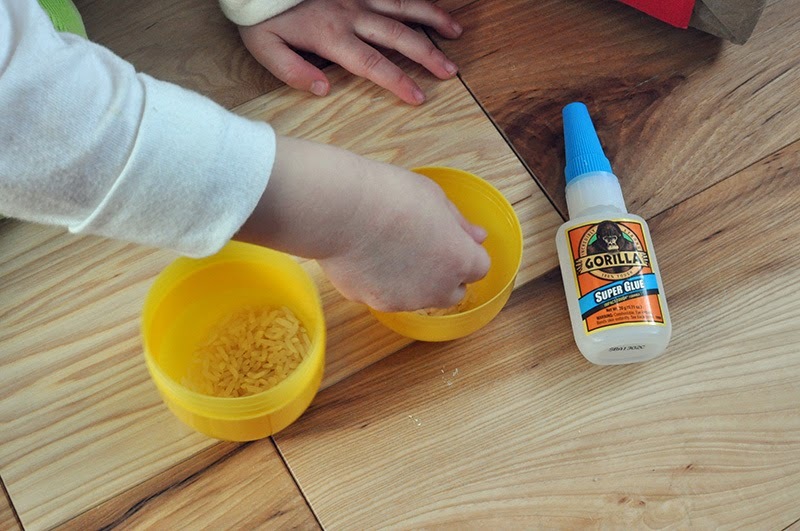 She goes to music class at school and comes home talking non-stop about “shaking eggs.” So, one Saturday morning as she was trying to dance around with imaginary egg shakers, I grabbed these three supplies. We filled the eggs with everyday rice. By the way, one of those eggs is actually a plastic pod that toys come in from a vending machine, the other is a plastic Easter egg. Then, out of her reach, I glued the edges of the egg and snapped them together. 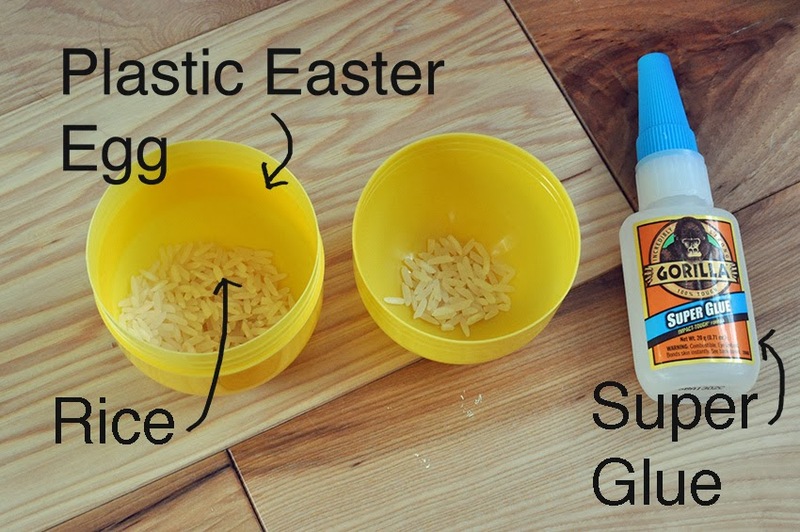 The next step is important – wipe any excess glue off with a paper towel or rag to avoid gluing yourself to the egg. Then, allow egg to dry completely before using. 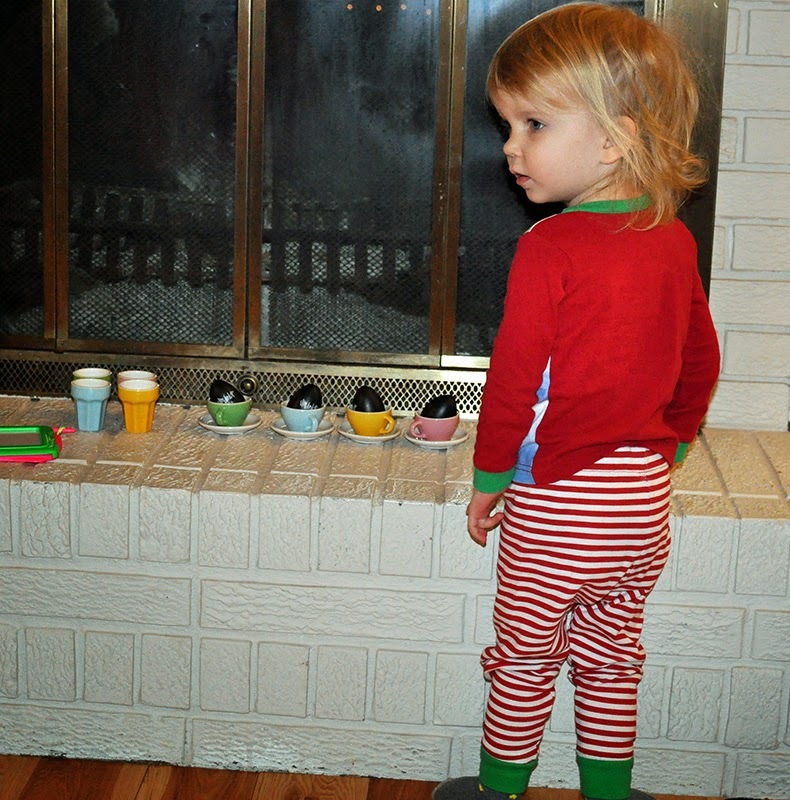 Greta went bananas over them…until Santa brought her legit music egg shakers for Christmas. They are the four black eggs in cups on the fireplace in this image. Sigh, well, at least she has extras for family and friends. This recipe comes to you as a refreshing way to bake with the delicious tastes of winter, but without over doing it on fat, calories, and sugar. 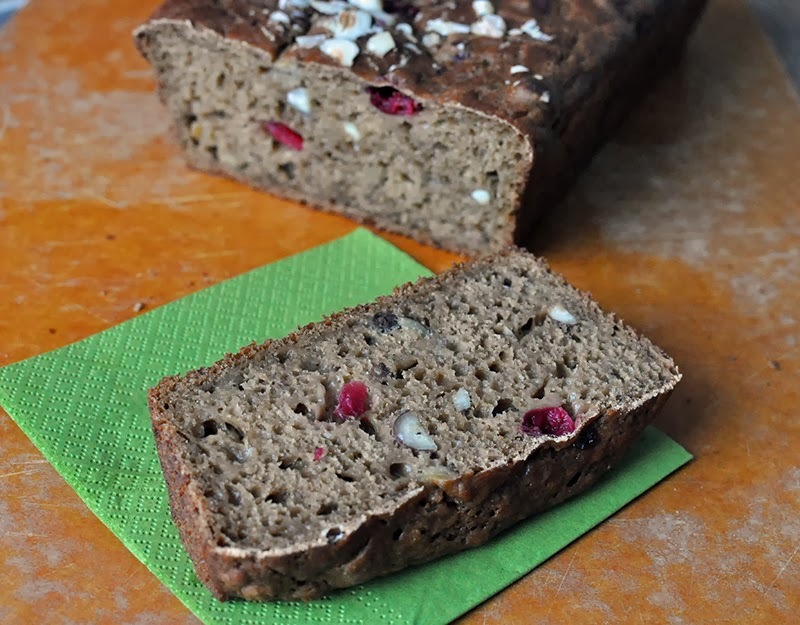 The reduced sugar, tart cranberries, and swap of bananas for oil makes this bread all the more satisfying. 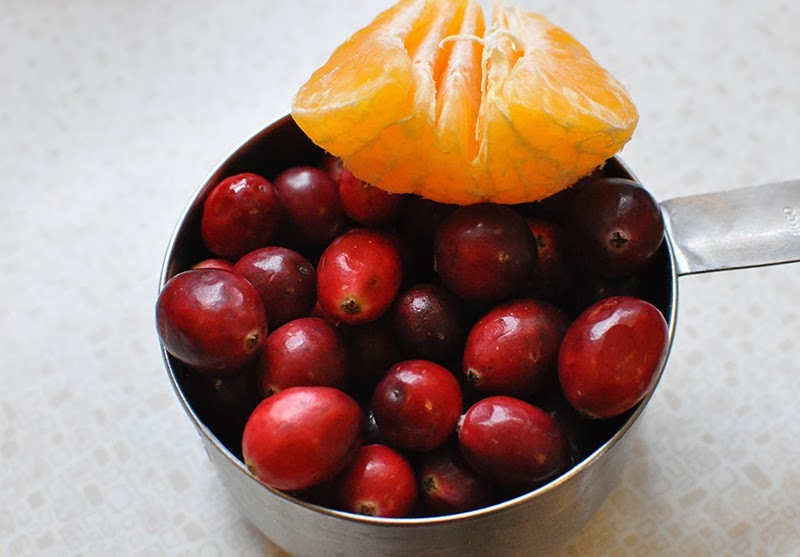 I just love the cranberry orange combination. I find myself mixing the two juices for breakfast for a tart jolt in the mornings. This zester is rubbish, just for the record! I recently bought it to replace my beloved trusty zester of many years. I miss my old Microplane one so badly – it disappeared along with a shoebox full of other kitchen essentials after we moved. I swear that there is an evil moving troll who steals things during moves. 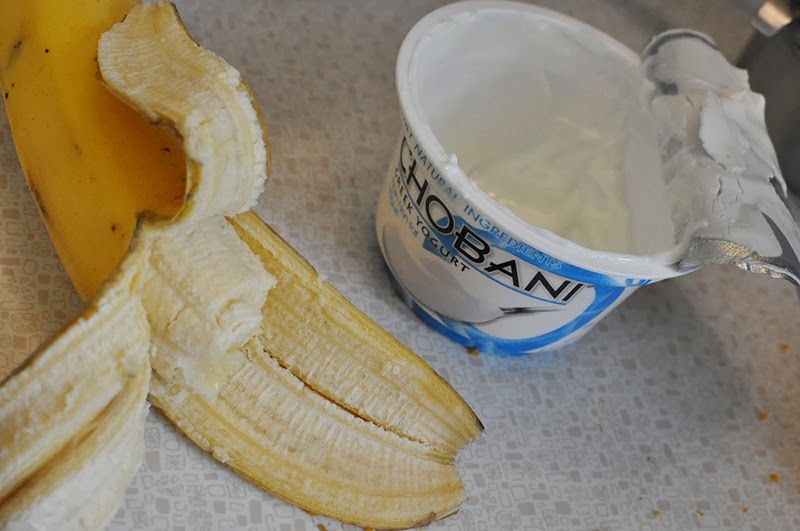 Two things I also love about this recipe – banana swapped for cooking oil and fat-free Greek yogurt for moist texture. Fold the fresh cranberries in gently. If you are using frozen berries, make sure they are thawed first. Dried cranberries could be used in a pinch, but often then are sweetened and will not be quite the same as fresh cranberries. Hazelnuts are another one of my favorite flavors. I’ll be honest, it was Nutella that first got me hooked on hazelnuts. Get them from the bulk aisle to save money, and start with just a few at a time if you haven’t used them before – they are pricey! I buy fresh ones, none roasted, that is. Allow the bread to cool completely before slicing. If you are impatient, you will just end up with hack job slices of bread, no big deal. This can also easily be made into muffins, read the recipe for that. 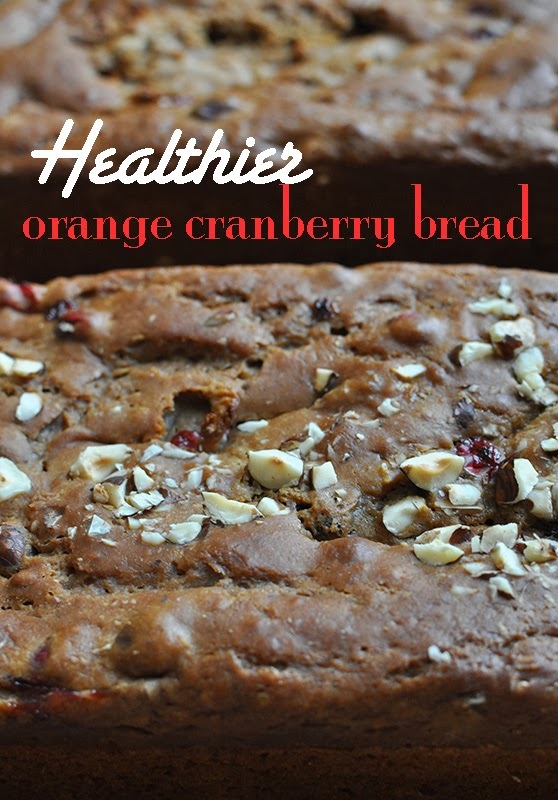 Healthier Orange Cranberry Bread – adapted from Conscious Cuisine, Neff, 2002. 1. Preheat oven to 350 degrees. Grease 12 standard muffin cups or 1 loaf pan. 2. In a mixing bowl combine: 1 cup whole-wheat pastry flour, 1 cup all-purpose flour, 1/2 teaspoon baking soda, pinch of salt, 1/4 teaspoon ground cinnamon, and 1/8 teaspoon ground nutmeg. 3. In a separate bowl combine just till moistened: 1 egg, 1 cup plain yogurt, 1/2 cup orange juice, grated zest of 1 orange (about 1 tablespoon), 1 cup coconut sugar, 2 tablespoons pureed banana, and 1/4 teaspoon vanilla. 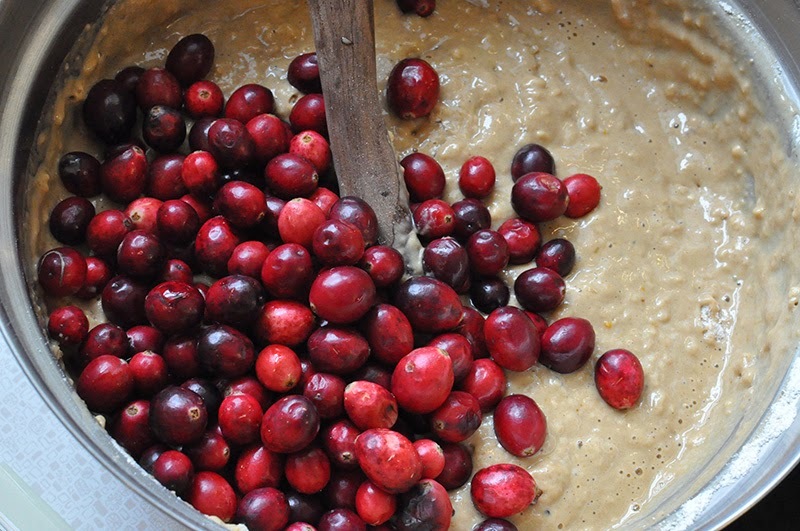 Fold in 1 cup of fresh cranberries and 1/4 cup chopped hazelnuts. 4. Pour batter into loaf pan. Or, if making muffins, pour 1/3 cup batter into each prepared muffin cup. Sprinkle top of batter with chopped hazelnuts, if desired. Bake for 50 – 60 minutes for loaf or 30 to 35 minutes for muffins, or until knife inserted near the center comes out clean. If the loaf of bread darkens too quickly, cover loosely with aluminum foil during the last 20 minutes of baking. 5. Allow to cool in pan for 5 minutes. Remove from pan and allow to cool completely before slicing bread. 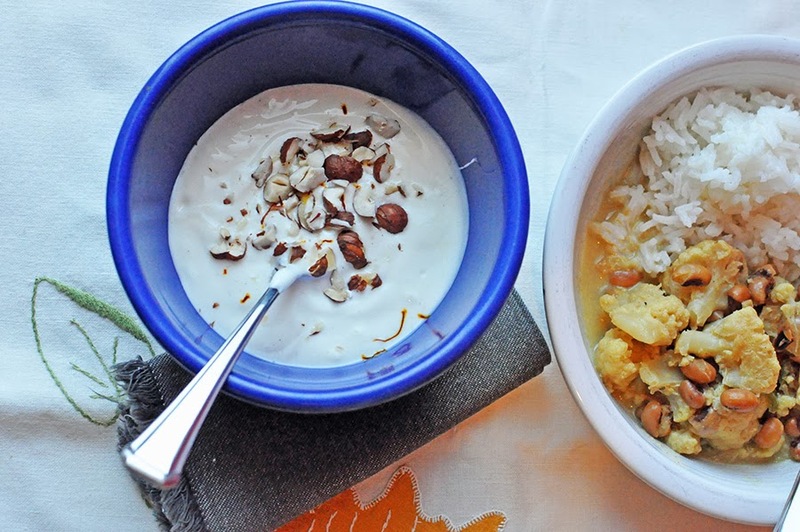 For New Year’s Day our family dined on Indian inspired delicacies. I whipped up my version of sweet yogurt with saffron as the dessert on this cold, snowy first day of 2014 in Iowa. Saffron is one of the main flavorings of this sweet and subtle dish. Saffron, picture above, is the world’s most expensive spice. It is actually the dried center, or stigma, of a crocus plant that grows in northwest India, the Mediterranean, and Turkey. 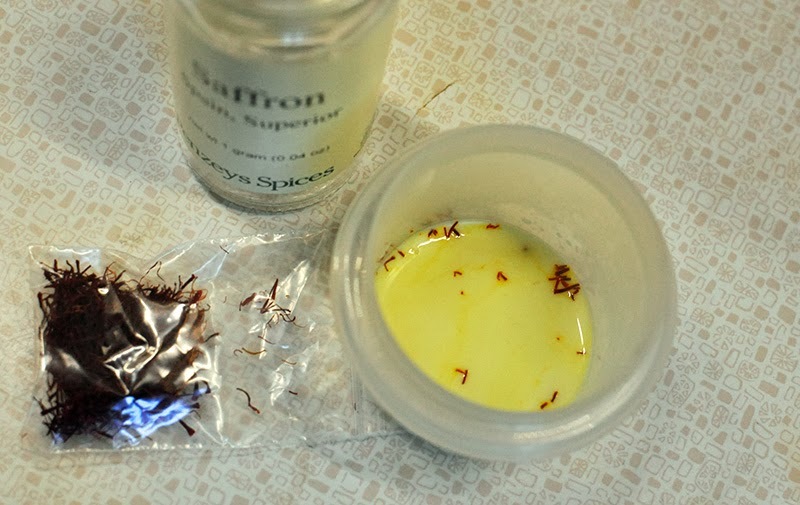 Saffron should be stored in the freezer to maintain its fragrance and the powdered kind should not be used if you want the best aroma from this spice. The recipe originally called for sugar, I substituted honey for a different flavor. I did not give an exact measurement, as I find that the sugar preferences vary from person to person. I served my yogurt dish as the ending to a meal that was inspired from NPR story on the traditional Southern New Year’s food, Hoppin’ John. This dish consists of black eyed peas and rice, but this NPR story was an Indian twist on Hoppin’ John. Click here for the story and recipe. I did make a few changes – I left out onions, curry leaves (did not have them), and added cauliflower for more veggies. I also opted for cooking mine in the slow cooker on low for 7 hours during the watching of that awful(!) Hawkeye bowl game. Eric and I made it out on New Year’s Eve for a couple hours. 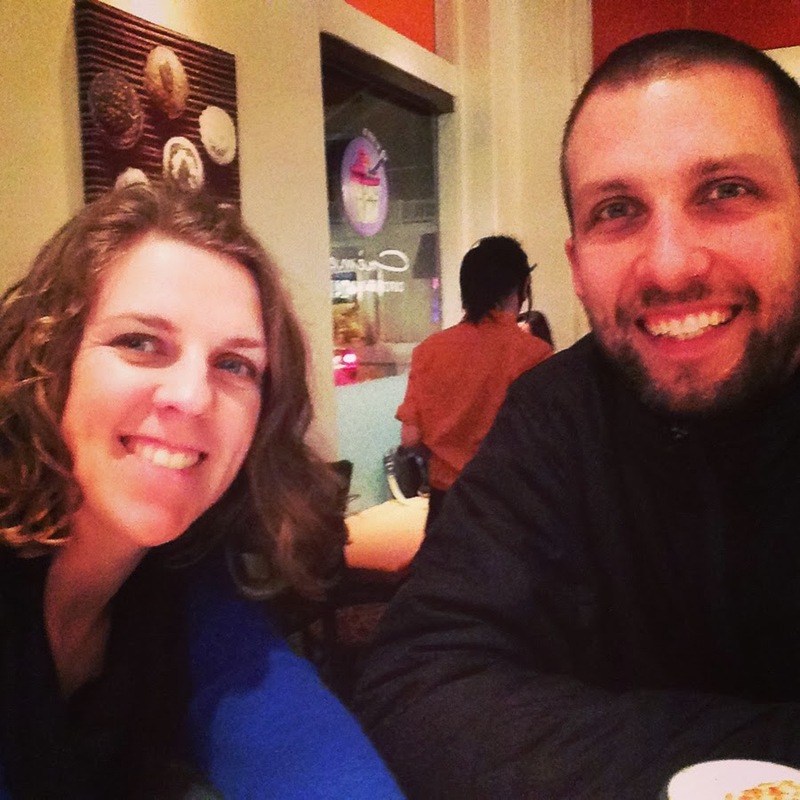 We had dinner at Thai Flavors, in Des Moines, first and then headed over for dessert and nightcaps at Creme Cupcake in Des Moines. If you live in the Des Moines area and have yet to visit Creme, you are missing out! In the evenings they have a simple menu with a savory pizza, a few desserts, and plenty of delicious drinks to choose from. 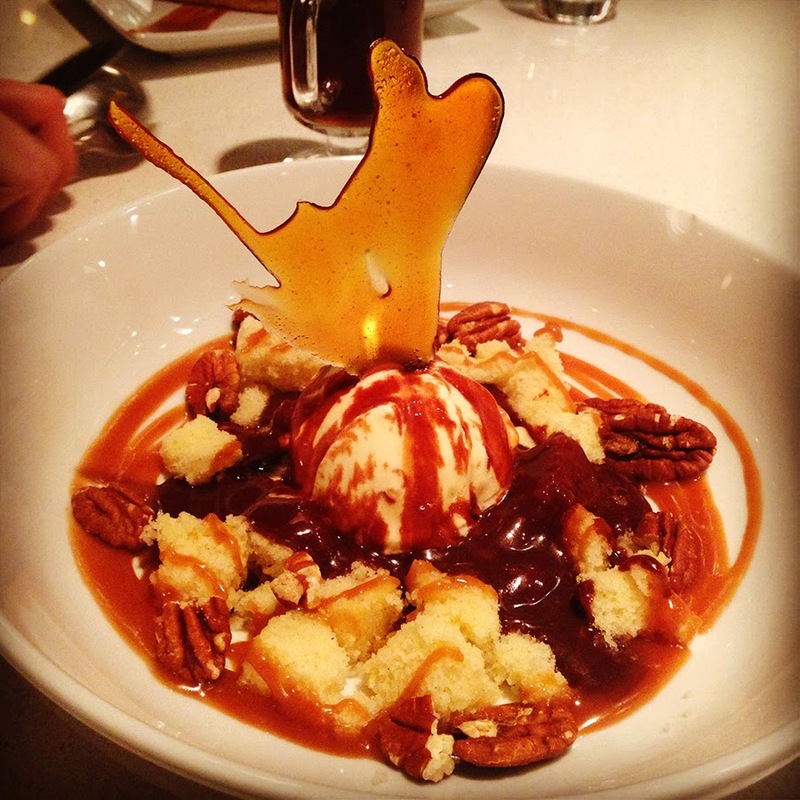 I chose the New Year’s sundae special, made from ice cream, hot fudge sauce, cake bits, caramel, and pecans. Almost too pretty to eat! 1. 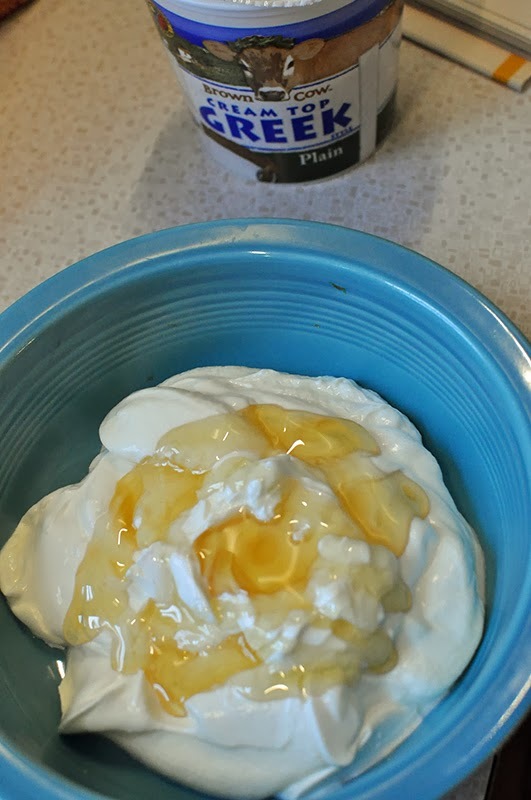 In a medium bowl mix: 2 cups plain yogurt, 1/8 teaspoon ground cardamon, and a generous drizzling of honey (enough to cover the top of the yogurt, see photo above). 2. 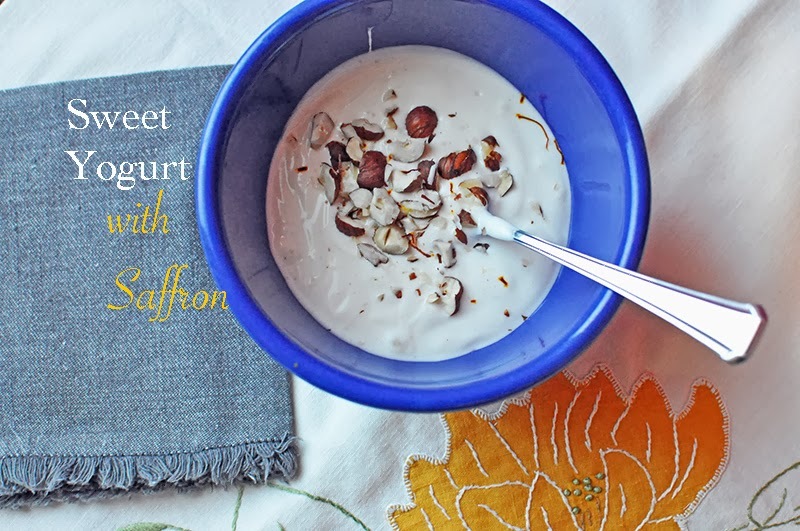 In a small bowl, warm 2 tablespoons of milk or milk alternative. Add a pinch of saffron strands and allow to soak for a few minutes. Mix the saffron mixture into the yogurt mixture. 3. 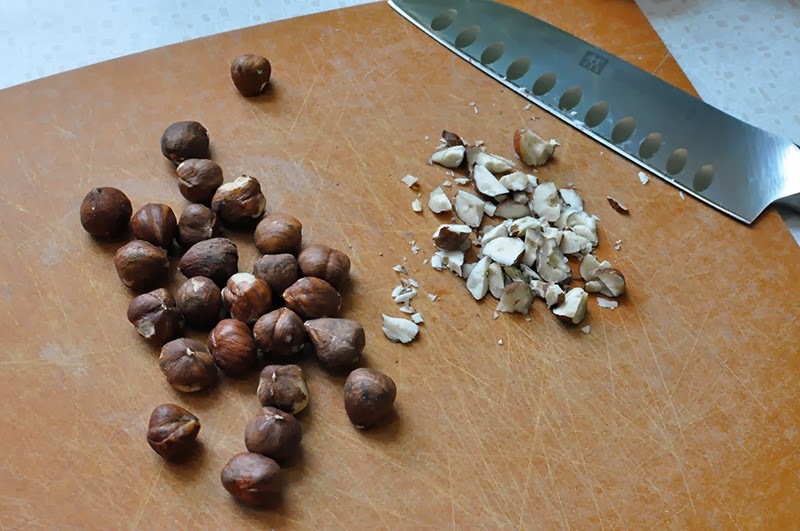 Top with chopped hazelnuts and/or pistachios. Serve chilled. For a stronger flavor, mix this up the day before serving.